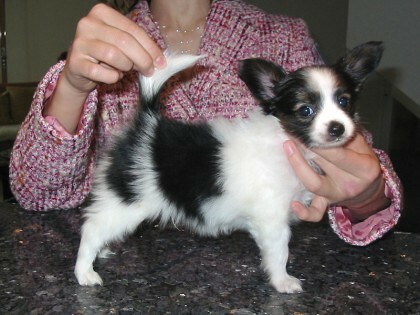 At my breeding site I have a small group of chosen breeding and show dogs. We like to participate in shows and have a proven record of success. We consider the presentation of those beautiful and elegant papillons as very important. For me quality comes for quantity, therefore I attach great importance to aesthetics and elegance. Hence we have only a limited number of litters a year. 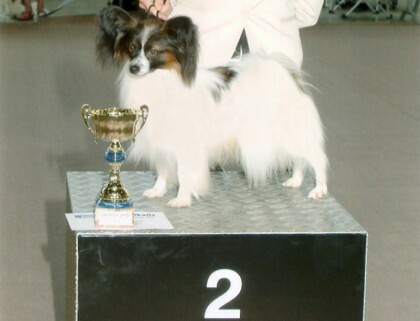 In 2004, I received the "Golden Insignia Award", a recognition of quality by the Swiss Cynology Society, Berne which is awarded only to kennels demonstrating higest quality standards. Our papillons live with us in our house and garden in an idyllic rural area environment in the district of Iberg near the town of Winterthur. In the surrounding area, there are meadows, grassland with grazing cows and goats and forest land. Now and then, large herds of sheep can be seen crossing the open fields. We make sure that the diet of both our puppies and the grown-up dogs is healthy and diversified. Daily walks are a regular part of life, and it is always a pleasure to see how people react when we come along with a whole bunch of small, differently coloured, lively dogs. The puppies are used to play in groups, junior class-, socializing- and agility groups are no mysteries to our dogs. They love to be occupied, are always ready to engage in any activity whatsoever and get along with other pets. The puppies are perfectly familiar with our household and excellently socialized. Myself, I am a fully-qualified puppy trainer and train puppies according to © Original Kynologos. It is important to me that to the best of my knowledge the puppies which leave my house are socialized and their characters are stamped. Contact with our dogs of course does not end when a puppy is sold. We are always there to provide support and advice to the buyers of our dogs.